Climate Change Connection > Science > What about lag time? In the past, carbon dioxide levels rose AFTER temperatures rose. Does this indicate that rising carbon dioxide levels today are an effect of, and not a cause of, rising temperatures? The natural progression of ice ages and the observed increase in the global average temperature since industrialization have two very different drivers; ice ages are driven by natural triggers, while recent warming is not. Figure 1 shows how current atmospheric carbon dioxide levels are obout 400 ppm (parts per million), which is the highest concentration in at least 650,000 years (1). This huge increase in CO2 is largely due to human activity. The start and end of ice ages are natural processes that have occurred throughout our planet’s history. Natural processes like the Milankovitch cycles trigger ice ages. Ice core analysis does reveal that increasing atmospheric carbon dioxide levels did lag behind increasing temperatures at the end recent ice ages. 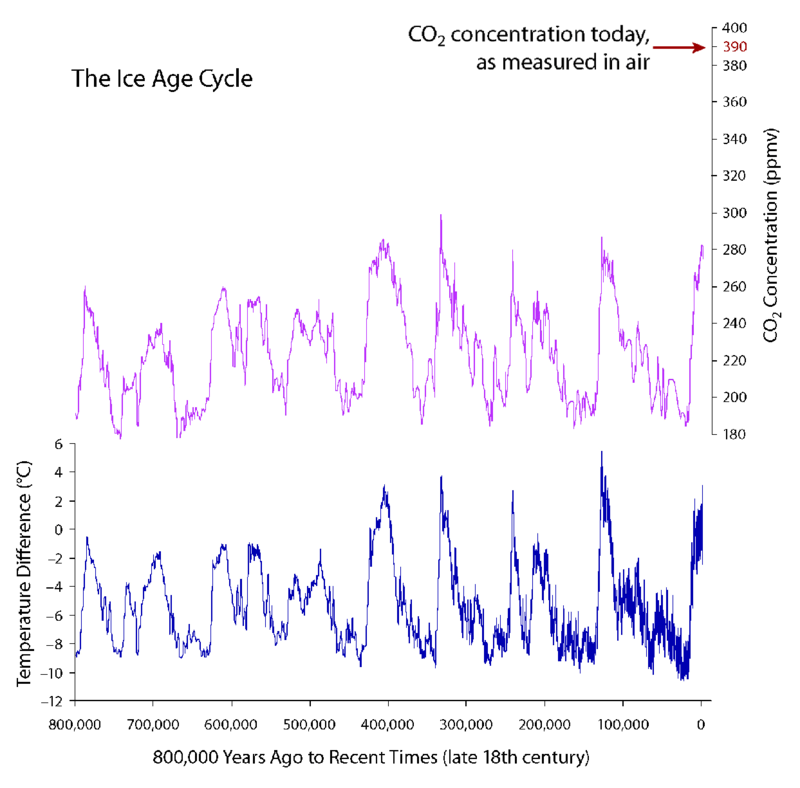 Although there is a certain degree of uncertainty regarding the lag time, it is generally accepted that at the end of an ice age, temperatures began to increase, and then carbon dioxide levels began to increase (2). The progression of an ice age, as well as the retreat of an ice age, is helped along by various feedback processes. Although the increase in temperature occurs prior to an increase in carbon dioxide, carbon dioxide plays an important role in the retreat of an ice age. As carbon dioxide in the atmosphere increases, the greenhouse effect is strengthened, and a greater degree of warming occurs. It is also important to remember that the lag time between temperature and carbon dioxide is relatively small when compared to the overall process. Although the temperature to carbon dioxide lag can be several hundred years, the time that it takes to transition from an ice age to an interglacial period can be measured in the thousands of years.